As they say, a word sometimes can inspire a thousand images; the words Punjabi, pride, Sikh, energy, hospitality, delicious, color, and pageantry offer a good description of the weekend events surrounding the Vaisakhi Gala in Toronto sponsored by the Centennial Foundation. It was evident that talent, cultural heritage, creativity, facets of history, outstanding pioneers and achievers, excellence and awareness in the global Sikh community were on display. It was a matter of immense pride to witness that as a distinct ethnic and faith community the Sikhs are aggressively searching and striving for a rightful place within the fabric of new adopted lands; pursuing individual dreams and shaping collective future as world citizens; and adapting to new realities and making outstanding contributions in many diverse fields. Vaisakhi or Baisakhi is one of most important holy days in the Sikh Calendar. It marks the beginning of the wheat harvest in the Punjab. On this day in the year 1699, the Tenth and last Sikh Guru, Gobind Singh, gave his followers a distinct identity and Code of Conduct to follow. This year as in the past, on the holiest week in the Sikh religious calendar, a vital but often neglected dimension, that of the significant contributions to science and technology, business, the arts, culture, community, faith, and heritage made by the global Sikh community were proudly showcased and celebrated by The Centennial Foundation. For this occasion, over 600 Sikhs and non-Sikhs from many countries had gathered in their festive regalia at The Carlu, a famous convention facility, rich in art deco motif, in the heart of downtown Toronto, to honor twelve outstanding individuals. The faith elements were never far away. Several paintings on display in the reception space had Sikh religious themes and images. The evening program began with Ardas (the Sikh prayer) by a young student, Kirpa Kaur. The famous hymn of Guru Gobind Singh printed on the back page of the formal Program booklet reminded us of our conduct and response to life and events. One could sense that each guest had brought his or her own unique spiritual energy, special gifts, and faith understandings to the august and colorful gathering. The evening honored those who have already achieved great success, spotlighted those who represent incredible promise, and remembered those who have left their lasting footprints on the sand and spirit of times and places. We knew that without the sacrifices and struggles of early Sikh pioneers we would not be standing here in such pride, dignity, and acceptance today. The individuals honored at the Gala have proved to themselves and to us that it is possible to be the best among the brilliant and excel against outstanding odds. One needs the will, a daring and innovative spirit, and unshaken determination. They understand that the presence of a strong faith, networking with people and institutions, making new friends, and presenting a vision that serves many, makes a difference. The Honorees have these qualities in abundance. I had the pleasure to visit with Dr. Sheela Basrur, one of the Honorees at the Gala, who is the brilliant and very accomplished Chief Health Officer of Ontario and Assistant Deputy Minister of Public Health in the Ontario Ministry of Health and Long-Term Care. In response to a question about the Canadian Universal Healthcare System, Dr. Basrur said that the Canadian Healthcare Model is based on our, “collective responsibility, collective good; everyone pays, everyone benefits.” She gently and with the courage of her conviction added that, “any civilized country, anywhere, should provide healthcare as a basic and fundamental right.” I hope that someday this vision will be possible in all nations. Waris Singh Ahluwalia: Waris is a Sikh actor who has worked with Hollywood actors Denzel Washington and Bill Murray. He is the creator and promoter of “House of Waris” jewelry brand. Bhupinder (Peter) Singh Bance: An independent researcher, author, and historian; Peter has a keen interest in Anglo-Sikh history. He signed copies of his book on Maharaja Duleep Singh. Tejinder Pal Singh Bindra: Senior Vice President and co-founder of Jeetish Group of Companies, Teji Bindra is the man behind the endowment of the Chair in Sikh Studies at Hofstra University. He is the President of Sikh Art and Film Foundation that organized the Sikh Exhibit at The Ruben Museum. Navjeet (Bob) Singh Dhillon: A Real Estate magnate, Mr. Dhillon is the President and CEO of Mainstreet Equity Corp. Bob Dhillon is poised to become the first Sikh-Canadian billionaire. Dr. Hew McLeod: Dr. McLeod is one of the giants in the field of Sikh scholarship in the English language. Based in New Zealand, he is the author of dozen books on Sikh history, philosophy, culture, Scriptures and literature. Navneet Singh Narula: Navneet from New Delhi is a Senior Management Consultant with Accenture LLP. He serves as a Director of Community Empowerment at United Sikhs, a global humanitarian relief NGO. Amrita Singh: A graduate of The Fashion Institute of Technology and the prestigious Bergdorf Goodman in NYC, her distinct “Amrita Singh Jewelry” is a major rage with Hollywood celebrities. She has worked with world-renowned designers: Oscar de la Renta and Christian Lacroix. Bicky Singh: Bicky is an unassuming and deeply motivated philanthropist, community servant, and patron of the arts. Besides his successful IT empire, The Future Computing Solutions, Inc. (FCSI) in California, Bicky is the Chairman & CEO of Sikhpoint.com and Trustee of The Spinning Wheel Film Festival International. Bicky and his colorful turbans with custom designs light up a gathering with a sense of pride. Harmander Singh: Harmander is a Corporate Strategy Office for Tower Council in the UK and principal advisor to the “Sikhs in England.” He is a personal trainer for Fauja Singh. Other persons of note who were part of the 2007 Vaisakhi Gala were the Emcees: Amrit and Rabindra Kaur Singh; Keynote Speaker: Ratanjit Singh Sondhe; Special Guest: Kanwal Prakash Singh; Artist: Gagandeep Singh; Canadian artist: Kanwar Singh Dhillion; Film Directors: Harvind Kaur and David Gray. Other contributors included: An Exhibit - Anglo-Sikh Heritage Trail; Thrilling Bhangra and Giddha dances by Nachdi Jawani; Creations by Niranjan Singh. This list would be hardly complete without a mention of one of the brilliant, farsighted Sikh Canadians, T. Sher Singh. Sher is an author, scholar, journalist, thinker, and a fighter of the legitimate rights of people. He is a man behind big ideas to advance Sikh faith, arts, culture and community; and most certainly a true Canadian and world citizen. The Singh Twins- internationally-acclaimed artists, writers, and filmmakers- dressed identically in luscious embroidered-in-gold magenta Punjabi suits, looking radiant served as the Mistresses of Ceremonies at the Gala. The celebrated and intricate creativity of the Singh-Twins was being introduced to many for the first time through the art on the cover of oversized Gala admission tickets; and their spirit through their kind and friendly persona and professionalism as MCs. Delicious Punjabi North Indian vegetarian and non-vegetarian dishes were on the menu at Friday night’s Reception in the beautiful home of Dr. and Mrs.Birinder Ahluwalia, Co-Founder of the Spinning Wheel Film Festival. There was a crowd of some 75 honored guests, special friends, Foundation Board members, Gala Planning Committee, and volunteers at the Reception. A colorful program awaited the 600 guests at the Gala and they were greeted by several honored and special guests. It was a colorful crowd, a family-friendly event. One felt proud of the achievements of Punjabi Sikhs. Even more amazing is the fact that they are in so many diverse fields and pursuits. The Premier of Ontario, Honorable Dalton McGuinty, who recently returned from a trip to India and a visit to The Golden Temple, The St. Peter’s and Vatican of the Sikhs, saw the value of the unique cultures that are converging in Canada and challenged the gathering to try even harder to maintain their traditions, culture, history, and heritage. Canada is seriously committed and supportive of diversity as an enriching and transforming vital asset and an advantage rather than a threat or distraction to her future as a nation. Canada recognizes the expanding interdependence and globalization, emerging new marketplaces, and the continuing transcendence of people and cultures, and sees promising immigrants as a bridge to the world. To introduce and reinstate our pride, a documentary about U.S. Congressman Dilip Singh Saund produced by Harvinder Kaur was shown to the gathering. Dilip Singh was the first Asian and Sikh from Punjab to serve in the U.S. Congress in the late 1950’s and early 1960’s. Mr. Saund is a forgotten and unsung hero for our own community, and so is the heartbreaking struggle of Sikhs who came to Canada on The Kamagata Maru and tried unsuccessfully to immigrate came to Canada at the end of the 19th century. A short trailer, “Searching for the Sikhs of Tod Inlet,” directed by David Gray, took us to a time and place that showed the true struggle of the earliest Sikh pioneers in Northwestern Canada. The young dancers of Nachdi Jawani stole the cultural show. They gave a good demonstration of the color, vigor, and energy of the traditional Bhangra and Giddha, the folkdances of the Punjab. Their dances were a pure delight, an explosion of raw energy and traditional abandon of the hardy Punjabi farmer; and their costumes, a riot of color that echoed the vibrancy of Punjabi spirit and love of festive opulence. 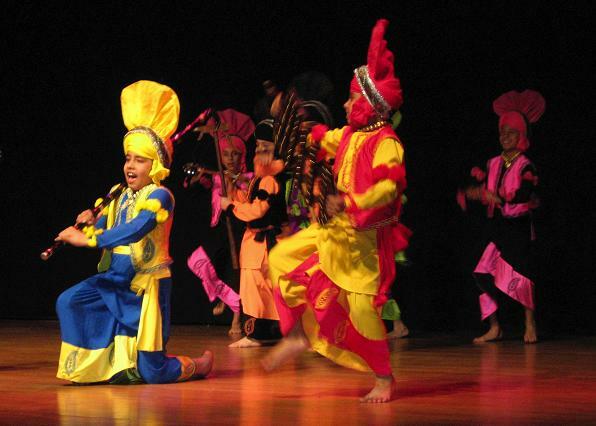 This unique and contagious energy, style, and spirit of the famous Bhangra and Giddha dances is shaped by geography, checkered history, and frequent cultural storms that marched across the region, the Northwestern land Gateway to the Subcontinent of India. Now imagine that it is scattered across the lands where we live! As the formal evening program in the main banquet hall ended, the guests moved to the exhibit and display areas to enjoy the jewelry of Amrita Singh, creations of Niranajan Singh, exhibit and artifacts associated with the life of Maharaja Duleep Singh, and book signings by Ratanjit Singh and Bhupinder Singh Bance. In the main Reception area, KP Singh signed the elegant 2007 Sikhpoint Interfaith Calendars for the guests. As with any event of this magnitude and importance, its success depends on major sponsors. 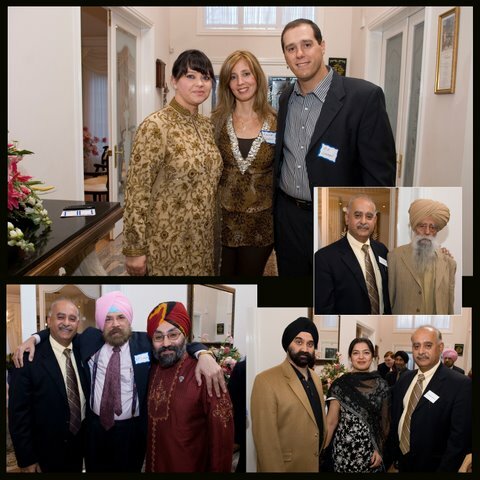 The Vaisakhi Gala had several prominent sponsors. Among them: FirstLine Mortgages, Earnst & Young, OMNI, RBC Finanacial Group, TD Bank Financial Group, Scotiabank Group, Toronto Star, and Sikhchic.com. All major “2007 Gala” Sponsors were invited to the stage and honored with special gifts. Gala volunteers and members of the Gala Planning Committee were thanked by Parminder Singh, Chairman of 2007 Vaisakhi Gala. True to the “2007 Vaisakhi Gala” theme, “Westward Ho! ~ A Celebration of Sikh Roots in the New World," the evening was a lesson in the continuing story of settlement of Sikhs in the West. There was ample evidence of their success and landmark triumphs; continuing struggles and yet unconquered areas; determination to make their new home in an image that best nurtures their spirit. Sikhs are beginning to understand their new environment and responsibilities. Their pioneering spirit is self-evident; their hard work, an accepted fact; their confidence to succeed, a proven testimony; and their sense of place and future, a sacred and unmistakable commitment. For ethnic and religious immigrant communities, their culture and faith are non-negotiable and sensitive areas. Faith and culture are a major force that bring us together and enhance our sense of belonging to a place as we transplant our hopes and dreams in distant lands and new communities. Being far removed from our familiar associations and experience, our history and heritage, images and memories, cultural rhythms and textures suddenly awaken and tug at our soul and we look to their resource for inspiration and survival. I am convinced that we will be better citizens of the world and mainstream our loyalties, talents, and commitments with greater excitement where our culture, faith, ethnicity instead of being ignored or intruded upon, remain a vital part of our sacred rights; embraced by society as an act of solidarity and farsightedness. It was heartening to see that welcome recognition, wisdom, genuine friendship, and understanding in the remarks of several Canadian leaders who addressed the Gala gathering. Despite the incredible positive energy at this and other similar international events, it is evident that as a community we are at the crossroads. We can safely anticipate new struggles and challenges ahead to ensure a rightful place for our faith and culture, greater acceptance of our faith-mandated identity, and win equal opportunities in Western countries. The answer in part may lie with us. We need to ask ourselves the million Dollar questions, “How can the Sikh community play a larger role in building the nations where they live?” “How best can we highlight and create a special place for the Sikh arts, culture, and significant heritage for future generations? We also need to recognize that we are a part of an emerging world culture and community. Then get to work to address and bridge these gaps with a sense of urgency. This will be by no means an easy task for any one organization, community, or generation. By any stretch, this is a formidable challenge in the existing climate of mistaken identity, unfounded stereotyped ignorance, unprovoked violence, and suspicion of everything unfamiliar. Our limited resources, experience, regional perspectives, and personal agendas often get in the way. We are increasingly more aware that to survive and excel in the face of new realities we have to step outside our comfort zones to the mainstream of life, opportunities, and intense competition in today’s world. We are at an international Holla Mohalla and with Guru’s Grace will triumph. pursue fields that are at the cutting edge of science and technology; others going back to learn the long-neglected ancient history and heritage, arts and architecture, culture and languages, sports and medicine, law-enforcements and public health, religions and matters of spirit; and human rights and civic freedoms. The Sikhs are challenging themselves, their fellow citizens, and societies to open wide the doors of tradition and institutions to allow and encourage the winds of new cultures to freely, and without fear, flow through our communities and nations. This task still has many hurdles and we must focus our energy to be full partners, not just expectant bystanders, for this dream to become a reality. As we train our sights to the West, we must proudly receive our wisdom and strengths from the East, North, and South as our personal unmistakable commitment to the ideals enshrined in the Sikh Scripture and sacred faith commandments that “All humanity is One Race, One Brotherhood.” We are here to give an honorable account of this lesson in living our faith each day. Sutguru Nanak, the Sikh Founder, who commanded us to “scatter to the ends of the earth” almost 500 years ago wanted us to multiply, prosper, and make a difference for all mankind. Our Gurus will be pleased how far we have come!